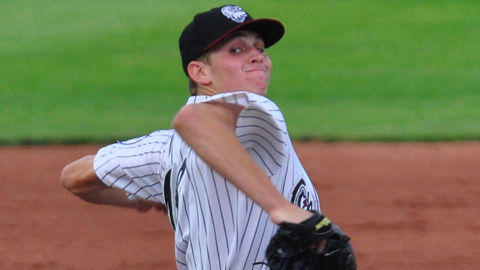 Idaho Falls Chukars left-hander Sam Selman was named Pitcher of the Year and Grand Junction Rockies outfielder David Dahl was tabbed MVP as the Pioneer League unveiled its Postseason All-Star Team on Saturday. Selman, selected by the Royals in the second round of this year's Draft, leads the eight-team league with a 2.06 ERA and 80 strikeouts. He's 5-2 in 11 games, including 10 starts, for the Chukars, who are battling for the second-half title in the Southern Division. Dahl, the Rockies' 10th-round pick in June, is second in the league with a .369 average after compiling a 27-game hitting streak from July 17-Aug. 15. He leads the circuit with 87 hits, 33 extra-base hits, 142 total bases and a .602 slugging percentage. The Orem Owlz, who are tied with Grand Junction atop the South Division in the second half, boast five postseason All-Stars. Outfielder Joel Capote, who leads the league with a .374 average, is joined by first baseman Wade Hinkle, shortstop Wendell Soto, designated hitter Michael Snyder and right-hander Gabriel Perez. The Rockies have three All-Stars, including Dahl and pitchers Eddie Butler and Scott Oberg. The rest of the team is Missoula Osprey catcher Michael Perez, Great Falls Voyagers second baseman Micah Johnson, Billings Mustangs shortstop Seth Mejias-Breen, Ogden Raptors outfielder Jeremy Rathjen and Mustangs left-hander Ismael Guillon. Billings' Pat Kelly, whose team owns the league's best overall record at 38-26, was named Manager of the Year.